An upper endoscopy is diagnostic procedure performed by gastroenterologists to examine the esophagus, stomach, and the upper portion of the intestines, known as the duodenum. The procedure is performed using a long tube with a camera and light attached to the end. This device is known as an endoscope. 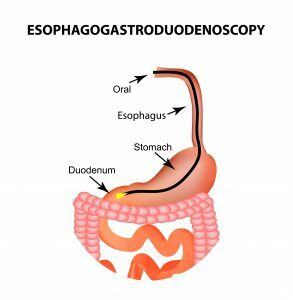 An upper endoscopy, also known as an esophagogastroduodenoscopy (EGD), is prescribed for patients who are experiencing symptoms such as abdominal pain, difficulty swallowing, nausea, vomiting, acid reflux, and many other GI symptoms. The procedure is also useful for collecting tissue samples, widening a narrowed esophagus, or retrieving food or foreign objects that may be stuck in the windpipe. What is the Prep for an Upper Endoscopy? The prep for an upper endoscopy, or EGD, may vary by physician, therefore you will receive instructions specific to your case. Most gastroenterologists will require patients to refrain from eating or drinking anything approximately eight hours before the procedure. Your stomach will need to be completely empty for the procedure. How do I Schedule an Appointment for an Upper Endoscopy? If your physician prescribes an upper endoscopy, you may call Tulsa Endoscopy Center at 918-528-4221 or fill out an appointment request form to schedule an appointment. If you need to schedule a consultation with a gastroenterologist to determine if this is the best procedure to further assess your symptoms or condition, call Adult Gastroenterology Associates at 918-481-4700.